Has anything in your life, that seemed almost inconsequential at the time, come back 20+ years later as something with potentially enormous significance? In 1992, I was less than a year out of college and settling in at my first real job. I was enjoying living on my own, and getting to know my way around Metro Detroit. Sometime early that year, our office building had the Red Cross in for a blood drive. I’d given blood on occasion in high school and college, and was comfortable with the process, so signed up for a slot and donated. As I munched on the post-donation juice and cookies, I flipped through some brochures that had been put out from a related organization. This other group was building a registry of potential bone marrow donors; for a cancer patient with no compatible blood relatives — especially full siblings — available to donate, getting a hit through the registry could be their only hope. I honestly can’t remember what in particular compelled me to fill out the form and apply to join the registry, but I did. I was most likely moved by the realization that I, having been adopted as an infant, almost certainly have no full blood siblings — and certainly none that I knew of or could ever locate. I think that made it easy for me to empathize with the plight of someone in a similar situation. And, heck, let’s face it: I was young and probably idealistic about potentially saving someone’s life. The registry deemed me healthy enough to join, and collected a small blood sample (they now use a cheek swab) to “type” me for the database. Human DNA has proteins called “Human Leukocyte Antigens,” or HLAs, attached to it. These HLAs serve as markers, to determine how good a match a potential donor is for a particular patient. There are a great many HLA markers — but ten in particular that are especially important and that doctors examine to assess the degree of match. As I understand it, six (or three sets of two) of these are relatively easy and inexpensive to identify; these six are what go into each potential donor’s registry record. When a patient needs a transplant, these basic six are used to greatly narrow the search. Anyone who makes the “short list” then submits a second blood sample and the expensive additional testing is done to identify his remaining four HLA markers. A donor and patient don’t have to match on ten out of ten, but the more common markers they share, the more compatible their bodies are. And therefore the greater chance the patient’s body will react well to the donor’s tissue. First, imagine pulling the lever on a slot machine, and needing ten different wheels to come up exactly the same in order to hit the jackpot. Or at least a large number of wheels coming up exactly the same before the machine pays out at all. I don’t know how many variations there are on each HLA marker (or “slot machine wheel”), but any way you look at it…that’s not a wager I’d put much money on. You’d need a awful lot of pulls on the lever (a very large database of potential donors) to get anything out of it. And the chance of any particular donor getting called for any particular patient would be small indeed. Second, think about U.S. postal codes. The country is divided up primarily into five-digit zip codes, many of which cover large stretches of geography. But look closely at some of your mail and remember: zip codes also carry a four-digit extension. These additional four digits are of course used to tag addresses that share a much more limited geographic area. These are very helpful for getting the mail onto the right delivery truck, so it reaches the destination as efficiently as possible. I like to think of those first six HLA markers as being like the primary five-digit zip code. The additional testing is like determining the four-digit extension. The object is to find someone as geographically close to the patient as possible. Over the last 22 years, I have never been asked to provide a second sample. In fact, for long stretches of time, I forgot I was even in the donor database. Sometimes I’d have a vague recollection that I’d registered with something or other, but I couldn’t have told you what it was. I was a bit surprised when, a few years back, shortly after we moved to Michigan, they contacted me and asked me to update my contact information (which I gladly did). But as far as I know, following the analogies above, I’ve never even matched more than a few wheels on a slot machine…or even been metaphorically in the same county as a patient (let alone the same zip code). About a week and a half ago, late on a Friday evening, I received urgent email messages in both my personal and work email accounts, asking me to contact the registry immediately. I’d come up as a potential match for a 71 year old male in need of a transplant. I of course picked up the phone right away and called. The representative explained that I’d been a close enough match on the first six HLA markers, they wanted to collect the additional four. She couldn’t tell me exactly how many of the six I’d matched on, but her tone implied it could easily could be all six. (“You’re more than in the ballpark,” she said.) After determining that I was still interested in being a donor, she explained more about the process going forward. I would be asked to go to a qualified lab or medical facility to have blood drawn into two separate sets of vials. These would go to two different labs, which would determine (1) my degree of match and (2) whether I had any latent infectious diseases the patient could catch. The transplant process involves completely wiping out the patient’s immune system before essentially replacing it with mine; if any sort of bug were to ride in with my donated material, the patient would have no defense against it at all. It could kill him in very short order. She also described the donation process. Depending on the doctors’ assessment, I might be asked to donate either bone marrow or to donate blood stem cells. Given the patient’s age, the representative said it would more likely be the latter (she explained that children tend to respond better to marrow, while adults respond better to stem cells). The process involves a preparatory phase, in which the donor is given multiple injections, over several days, of a drug which stimulates stem cell production. The stem cells are then collected using a process that pumps blood out of one arm, through a scrubber, and back into the other arm. I’m greatly simplifying the process, of course. And there is considerable discomfort associated with the procedure (and with donating bone marrow, of course, which would be done under anesthesia in an operating room). So why, after discussing the whole thing with Mrs. Yeoman Farmer, did I tell them I was still interested in going forward? Apart from it being a plain-and-simple good thing to do? Above all, Christian charity. A very particular person has a very particular and very desperate need, and only a very small number of people are in a position to assist. If it’s determined that I’m his best match, I absolutely want to help him. How could I possibly pass by the road, and leave him in the ditch? The donation process carries only a very small chance of complications, and therefore poses virtually no threat to my own health or ability to provide for my own family. We’re not talking about donating a kidney. As when I first registered, I still closely identify with and understand the plight of those who have no siblings available as potential donors. Given this patient’s age, even if he has siblings, they may not be in any position to donate for him. Given the patient’s age, he very likely has grandchildren. I can hopefully give those kids many additional years with their grandfather. I know my own kids would treasure that opportunity. And would greatly miss any of their grandparents, if that grandparent were to leave us prematurely. A very good friend of our family, who lives near my parents and is close to their age, needed a bone marrow transplant while undergoing treatment for leukemia nearly 20 years ago. His disease was far advanced, and his doctors were running out of options. A match with a national registry (quite possibly the same one I’m registered with) identified the donor, who stepped forward to save our friend’s life. Our friend made a complete recovery, and continues to live a full and active life today. How can I pass up the chance to do the same for someone else? None of us is an island; every one of us has friends. So does this patient. Being a donor means giving those friends additional years with that person they care about. I’m still not sure how this story will end, but I do hope that there will be additional installments. I provided my blood sample a week ago, so for now it’s just a matter of waiting. Could be three weeks. Could be sixty days. The representative said there could be ten people who’ve been asked to provide an additional sample — or I could be the only one. If it’s just me, they need to make sure I’m close enough to the patient’s type, and that I’m not unwittingly carrying something that could harm the patient. If there are multiple potential donors in the patient’s zip code, they need to determine which of us is best. I might be, metaphorically, five blocks away — but someone else might be living on his same street. So … stay tuned. And in the meantime, please give serious consideration to registering with Be the Match. Living on a farm, you never know when a curve ball will throw your whole day onto an unexpected trajectory. It could be the surprise arrival of a goat kid or lamb, especially one that needs human attention because the mother isn’t doing her job. It could be the stupid goat that snaps a leg going over a fence. Or any number of other things. Tuesday of this week, it was an early-morning collision on the road in front of our property. I was out in my office when I heard the sound of crunching metal. The dogs began barking, and I went to the window for a look. A car had stopped toward the western edge of our land, and two whitetail deer where headed across our hay field. The lead animal was bounding at full tilt, but the second one was hobbling badly. It wasn’t hard to deduce what had happened. Another vehicle stopped to assist the one that’d hit the deer, so I returned my attention to the hay field. It appeared that both animals were now long gone, but then I took a closer look. In fact, the trailing deer — a doe — had collapsed in the middle of the field. Her head would be visible for a few seconds at a time, struggling, before dropping below the tall grass. It was likely that the collision had broken some ribs, which had punctured a lung; it was how more than one of our beloved farm dogs had died over the years. I figured the humane thing to do would be to put her out of her misery. After trying to describe our location to the person on the other end of the line, the woman handed me the phone, and I told the dispatcher exactly what our address was. “I have a pistol and can put the deer down right now,” I added. “No, you can’t!” the dispatcher replied. “You need to wait for the deputy.” I was more than a bit taken aback by the dispatcher’s emphatic tone, but on later reflection understood the policy better. Without an officer to confirm the circumstances of the situation, it would be easy for a poacher to shoot a deer and then later claim he was euthanizing an injured animal. He could even break one of the animal’s legs, and/or a few ribs, to make the story more convincing. I assured the dispatcher that I would wait for authorities to arrive, then handed the phone back to the driver. But as she gave her name and other information, euthanizing the deer became moot. The poor doe went into death throes, and flopped flat onto the hay field. The driver’s voice broke with emotion, and could barely spell her own name for the dispatcher. I knelt and stroked the doe’s neck and head as the animal expired — even more as a gesture of comfort for the driver than for the deer. Once she finished with the dispatcher, the woman returned to her car and I went back to the house. I got a large wheelbarrow, took it to the hayfield, and after quite a struggle managed to get the heavy doe into the wheelbarrow. I considered bleeding the animal out, but didn’t want to risk having to explain a large knife wound to the officer. Instead, I simply wheeled the body up next to the woman’s car, told her I’d return once the police arrived, and then went back to my office to wait. I didn’t realize the police had arrived until I looked up and saw the driver bringing the wheelbarrow down our driveway to back porch. I looked out to the road, and saw the patrol car now behind hers. Apparently, the officer had been satisfied with what he’d seen and no longer needed the deer’s body. I grabbed my identification, and followed the woman back to her car. Her husband had also arrived, and the three of us stood around making small talk while the officer sat in his cruiser and worked on a computer. It was an unfortunate way to meet the neighbors (they lived just a couple of miles up the road from us), but I enjoyed getting to know them. While we were talking, our oldest son came out to the road to see what was going on. He told me he’d seen the carcass in the wheelbarrow, and had thought one of our own goats — one that indeed has coloration very similar to a deer’s — had died. I explained what’d happened, and assured him that all of our animals were fine. But it was still an amusing misunderstanding that injected some much-needed levity into an otherwise sad situation. I was tired of thinking that way, and decided to treat this deer as a learning experience. Yeah, I would probably make some mistakes. But so what? It had cost us absolutely nothing. The whole thing was a pure bonus. I left a message for a friend who has a lot more experience butchering deer, and who’d told me some time back that he’d be happy to teach me how to process a deer or goat. And then my oldest son and I got started as best we could. First, I got some heavy-duty baling twine, then cut holes near the each of the deer’s rear ankles to string it through. While I hugged and hoisted the deer as high as I could, my son pulled the twine over a large beam in the downstairs part of our barn. Problem is, though, that beam is only about seven feet off the ground. Even with the deer as high as I could string her, the head was still almost on the ground. Since I didn’t have any other options at the moment, we got to work as best we could. First, I cut the head off to allow as much blood to drain. Then, in the time before our friend arrived, I managed to disembowel the animal and get all the guts / organs removed. There was a lot more material, but the process was similar enough to eviscerating a turkey or goose. The twelve-year-old joined us somewhere in the middle of this process, and the two boys thoroughly enjoyed identifying each of the body parts as they came out. We saved the heart and liver (which were HUGE compared to their poultry counterparts! ), fed the lungs to the chickens and barn cats, and dumped everything else into an old feed bag for disposal. Our friend got there soon after I cut the hide and began peeling it off the deer’s hind legs and back like a sock. He’d brought a real block and tackle, which would work well using the rafters of our garage. He helped me cut the carcass down and move it, then he set up his hoist in the garage. A moment later, we lifted the remains of the deer into place. It still was a little lower than ideal, but a much better work space than the barn. It took us about 45 minutes or so to finish skinning the deer and cut off the neck. We then flipped the carcass around the other way, so it was now hanging from the front legs. This let us remove large chunks of meat, and the hind quarters, and he showed me how to remove the tenderloins and back straps. We also got a good look inside the chest cavity, which confirmed my suspicions about how the deer died: several ribs on her right side were badly broken, which had most likely punctured her lung. 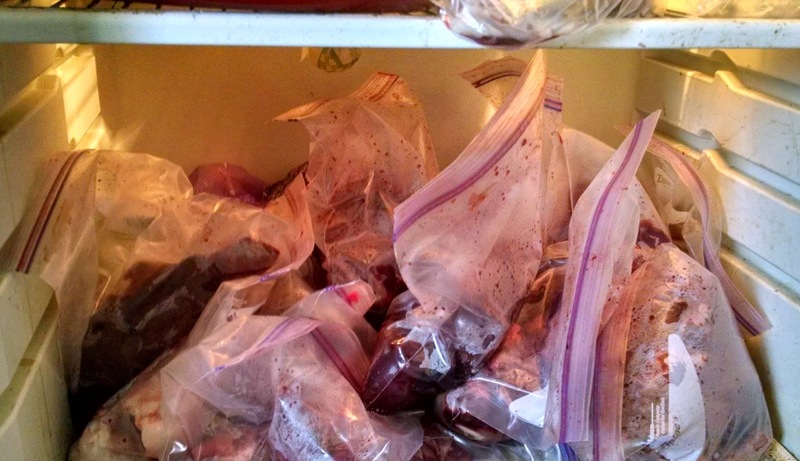 We put the meat in large food grade plastic bags, and stored them in a spare refrigerator. We made the mistake, however, of thinking the garage would remain cool enough to allow the fore quarters to hang and age for a couple of days. It was certainly cool enough at night (we even had our first frost early today), but the garage got warmer than expected during the daytime hours. When my neighbor returned this morning to help cut up the large pieces in the refrigerator, and to finish carving up the hanging carcass, we decided that the room-temperature meat would be more safely fed to the dogs. It just didn’t smell or look quite right. He apologized, explaining that he’d never butchered a deer this early in the fall. I shrugged and assured him that what we had in the refrigerator (easily 25-30+ pounds) would be plenty. This was a learning experience, and I’d learned something important. Besides, with all the lambs and goat kids we’re expecting to butcher this fall, I’m not sure how much spare freezer space we’ll have anyway. We spread the meat out on top of an old (dead) chest freezer that I’ve kept precisely for use as a butchering table. (We sanitized it with bleach water first, of course). We then cut up the large pieces of meat, filling gallon-sized Ziploc freezer bags about halfway each — about the right amount of meat for a meal for our family. Since we’ll end up simply throwing most of these in the Crock Pot, and then adding carrots and potatoes, I wasn’t very particular about neatly slicing and packaging anything. Hunks of meat were fine. Finally, I took what was left on a rear shank and submerged it in a saltwater brine. I figure it’ll make a really nice venison stew for our Sunday dinner this week. The Ziploc bags all went in the refrigerator to age for a few more days; I’ll transfer them to the freezer this weekend. And, in the meantime, I know the dogs will enjoy finishing up the fore quarters. I can honestly say … this is the first roadkill I’ve ever butchered. And the first that I’ll be eating. I wouldn’t have touched it had I not known its origins, and known personally how it died. But why let perfectly good and delicious venison go to waste? Best part is: I was able to use this “bonus” carcass as a learning experience, without fear of ruining one of our perfect farm-raised animals. And, you know what the best thing is I’ve learned? Butchering a large mammal is now Something I Can Do.